Trying to find the best Thai restaurants in Northwest Arkansas? Delicious and healthy Thai food is plentiful in NWA. Dishes made from fresh, natural ingredients, spices, herbs and vegetables are on Thai menus. Everything on the menu is made to order from only fresh ingredients. Thai Basil enjoys rave reviews from its patrons. Kids eat free during dinner all week long, and they also honor birthdays, graduations and anniversaries. Try the, to-die-for, spring rolls. 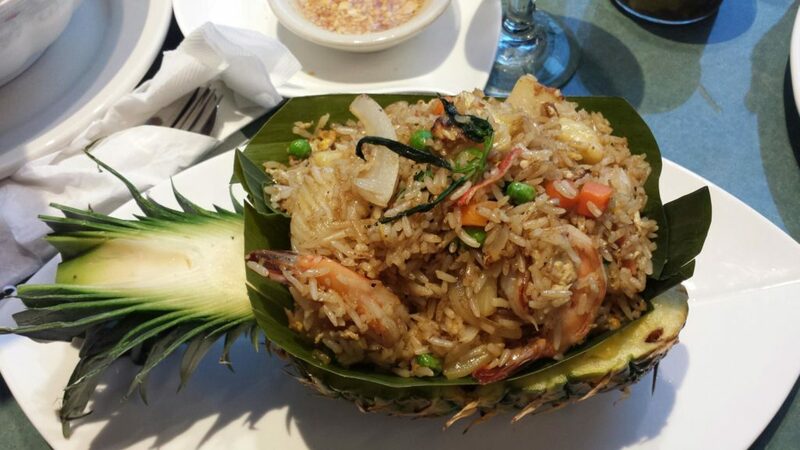 Note: Pineapple fried rice picture is courtesy of Thai Basil. Characterized by fresh, delicious Thai food, friendly and engaged service and cleanliness throughout. Everything is amazing and literally bursting with complex flavors including the spring rolls, egg rolls, Pad Thai, Pad King and Masaman Curry. Thai lovers will not be disappointed when they choose to dine at Thai Cuisine. their favorite dish from this popular Thai restaurant. Try the Pad Thai Noodle Soup, you’ll be glad you did. This restaurant has some of the most delicious Thai food in all of Arkansas. Whether you dine in or carry out, you are assured to have a memorable meal. Keeping step with today’s demand for healthier food, they also offer vegan, gluten free and allergy friendly menu items. Try the yellow curry and the spring rolls. Specializes in vegetarian, vegan and Asian fusion. Patrons love, love, love the food and the friendly family staff. Thep’s offers consistent delicious food, and makes it their business to deliver only a high quality experience every single time you visit. Noted for delicious authentic Thai food, large portions and reasonable prices. Fans travel from miles around just to eat at this place. Try the to-die-for Crab Rangoons, amazing Red Curry and the House Fried Rice. Grass Chicken and the Mango Sticky Rice Desert with Coconut Milk. love excellent Thai food, this place will not disappoint you. Try the Pad Thai and the Panang Curry for delicious examples of their menu offerings. Excellent choice for Thai in Fayetteville. You get fast, friendly service, awesome food and reasonable prices when you choose Thai e-san. Try the Red Curry and the Tom Kha.